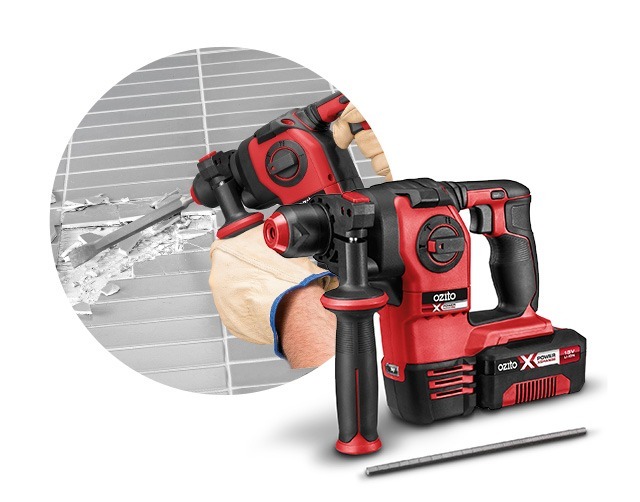 The new Power X Change 18V Brushless Rotary Hammer Drill has all the power you need to take on tougher jobs around the house. With three operating modes, it’s capable of hammering and chiselling into timber, metal and concrete. Longer battery life and efficient design offer greater power distribution. This makes it the perfect tool for DIY jobs such as removing tiles, breaking up concrete or drilling holes in tough materials. The new Rotary Hammer Drill offers greater control and is equipped with an anti-vibration rear handle and 360 degree rotating side handle to give you a comfortable hold on the tool and the confidence to unleash more power. The Brushless Rotary Hammer Drill has enough power to drill up to 30 mm in timber, 20 mm in masonry, and 13 mm in metal. With an LED worklight and metal depth rod you’ll be able work in low light conditions and easily achieve an accurate finish. As part of the Power X Change range, this tool is available as a skin, so you can choose the battery that best suits your needs. For tougher jobs, we recommend upgrading to the 18V 5.2Ah Ultra Battery with improved temperature control and increased battery capacity. This extra power will enable you to take on demanding grinding and cutting work. Adding more power and performance to your workshop needn’t be expensive. The 18V Brushless Rotary Hammer Drill is available at your local Bunnings Warehouse for just $179 AUD.